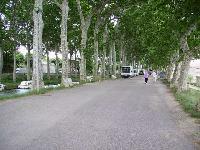 Visited Trebes in Sept 2008, one of the better Aires we have visited. Can get busy even in late Sept so best to try and arrive by early afternoon. Coming from coast turn immediately left after crossing bridge. Aire along canal bank. Update: This Aire has since closed.